On behalf of the Canterbury-Bankstown Peace Group I invite you to participate in a Vigil with the Theme: Season's Greetings for David and Mamdouh. I am of the idea that a Vigil could be held at major cities all around Australia concurrently, i.e., at the same time and day as the one taking place in Sydney. We could issue a media release thus attract media attention. I will be contacting other groups around Australia to see if this is possible. Terry Hicks contacted me and he is keen on the idea. I also spoke to Stephen Hopper and he thinks that this is fine. He will be contacting Maha to see if she could attend the vigil. We need to continue to put pressure on the government and demand the repatriation or release of these two Australian men. 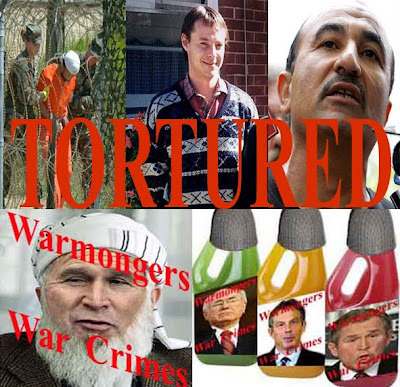 David and Mamdouh have been turned into the 'sacrificial lambs' of the infamous 'war on terror'. This could happen to any other Australian who happens to be travelling overseas. Furthermore, this could happen to anyone dissenting with government political policies and stand. Your comments and ideas are welcome. Please support this event and contact me if you would like to get involved in the organisation of this event.